From late April to early May, hundreds of thousands of shorebirds stop to rest and feed on the vast mudflats in Grays Harbor. After a brief stay, the birds move north along the coast of British Columbia and reach the Copper River Delta in southeast Alaska. Then it's on to their breeding grounds where long days and abundant food resources provide an ideal place to nest and raise their young. About two dozen species of shorebirds use the greater Grays Harbor estuary and coastline during spring and fall. Some birds overwinter in Grays Harbor. Most shorebirds can be identified by where they forage on the mudflat and the feeding methods they use. Coloration and physical shape also help you identify the species. 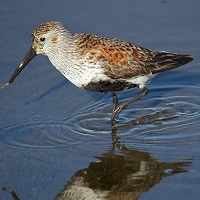 The pictures below show shorebirds in breeding plumage. Only at the very end of migration will these colors and patterns be this distinct. Look carefully at other sources to aid in shorebird identification. 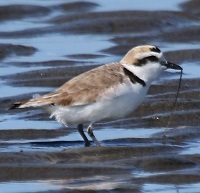 In breeding season this large, plump plover has distinct black and white plumage. They use their large eyes to search for food using a look-run-peck behavior on the mud or near the waters edge. During spring migration up the Pacific coast they forage on marine worms such as polycheates, lugworms, and blood worms and fly and beetle larvae, small bivalves, amphipods and shrimp. 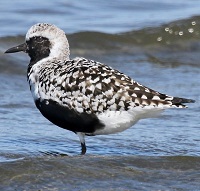 Black-bellied plovers spend the winter in grasslands and beaches along the coast from British Columbia to Chile. Large numbers winter in Grays Harbor. 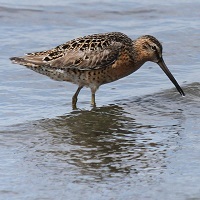 The two dowitcher species, Short-billed and Long-billed, are difficult to tell apart even for the experts. They feed in slightly deeper water using an up and down head motion like a sewing machine. Dowitchers on the west coast winter from California to Peru. In early March, they begin migrating northward in small groups. During the flight north, they fly 2,500 miles at a time without stopping to rest and feed. In late spring the white belly starts to turn into a conspicuous black belly patch which distinguishes this bird. Using swift probing movements, they feed near the water's edge for tiny clams, worms, and shrimp-like animals. Dunlins winter in the warm climates of the Northern Hemisphere and are one of the few shorebirds that winter in Grays Harbor. A tall and long-legged bird, most often observed alone or in small groups. It wades in shallow water with a distinctive bobbing motion, sweeping its bill back and forth to feed. 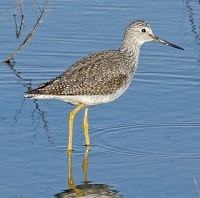 Observant birders can distinguish the Greater Yellowlegs from the closely related Lesser Yellowlegs by its different call and longer upturned bill. Both Yellowlegs species give a piercing call of alarm and are among the most vocal of shorebird species, but the Greater gives three notes and the Lesser two. This is the world's smallest shorebird, weighing only 0.7 ounces. 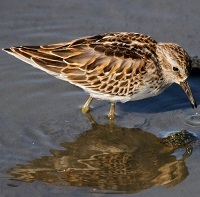 Compared to the Western Sandpiper, the Least Sandpiper has an overall darker appearance and a brown breast. Its yellow legs can sometimes help in identifying this bird. Least sandpipers forage at the upper edges of mudflats and in the low marsh vegetation. They feed by picking and probing in dry and wet mud for small invertebrates. least sandpipers migrate in small numbers and breed from Northern British Columbia to Alaska. 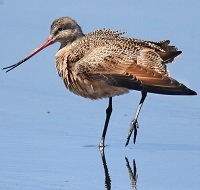 The long, bi-colored bill of the marbled godwit is one way to identify it in a crowd. Marbled godwits use their bill to probe the sand and mud for insects and crustaceans. Its cinnamon wing linings can be seen as it flies. It nests on the ground in the short grass prairies of the north, central mid-west and Alaska, and can be found wintering at Grays Harbor. 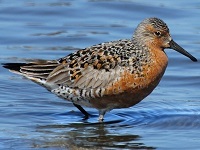 The Red knot is a late migrant often arriving in May. 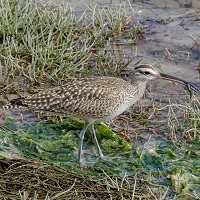 One of the largest shorebirds, in winter its back is pale gray and its underparts are white. In breeding plumage it has a reddish brown face, neck, breast and sides. Itd primary food sources in Grays Harbor are small bivalves, but it also forages for other invertebrates including crabs, other crustaceans and arthopods. Its migration is one of the longest of any bird, traveling over 9000 miles from the high Arctic tundra where it breeds to summer range as far south as Tierra del Fuego. 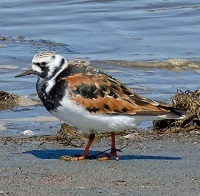 The Ruddy Turnstone is generally seen in the company of other shorebirds on the beach during the spring and fall migrations. A Ruddy Turnstone in breeding plumage is stout, and about the size of a child’s football. It is black and chestnut colored on the back and has orange legs. This distinctive coloring makes it stand out from the other birds it forages with. Its slender bill is perfect for overturning debris on the beach as it searches for insects, plant material, and crustaceans. Sanderlings are medium birds with pale gray winter plumage that turns reddish brown during breeding season. It has a distinctive habit of running along after receding waves picking up small animals left behind by the tide. At Grays Harbor, Sanderlings are most often seen in winter, along sandy ocean beaches rather than on mudflats. These small plovers have a very short black bill and a conspicuous black breast band. They stand upright and use their large eyes to see prey move, they then run to pluck the prey up, stop, and begin looking for prey again. In this way they hunt for mollusks, crustaceans and marine worms. They typically winter in South America and the southern U.S.
Western sandpipers are the most abundant shorebird seen during spring migration. Their black legs, longish, slightly drooping bill and rufous back and head markings distinguish the Western from other sandpipers. They feed on the mudflats and along the water's edge constantly walking and probing for tiny clams, worms and sand fleas. They winter along the coast from California to Peru. 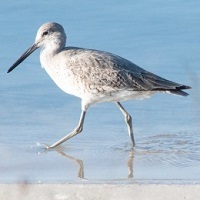 Other, less commonly seen shorebird species include Black Oystercatcher, Red-necked Phalarope, Rock Sandpiper, Spotted Sandpiper, Surfbird, Wandering Tattler, Black Turnstone, Willet, Snowy Plover, Pectoral Sandpiper.